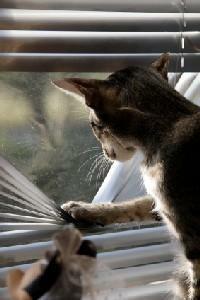 Window blinds, wires, the outdoors and other hazards can present dangers to our cats. Knowing some of the best safety tips can keep your pet safe. I moved in June with my three male neutered cats. They lived inside for about a month, and then I started letting them outdoors. There was an abandonded/stray cat that the neighbors were feeding. This cat was very nice at first and would always come around to get petted, but I never fed him because I didn't want him to hang around my house. The stray kept getting more and more violent toward my cats. Especially my "guard cat", the one that protected me and my other cats. A couple of days ago, the stray cat came into my house (through two cat doors) and killed my guard cat in my bedroom. Apparently my cat died of a broken neck inflicted by the stray cat. The stray cat was still in the house when we came home. Probably because the cat door from the kitchen to the garage was set to only allow cats to come in from the garage. There were three to four other cats in the house at the time, and none of them suffered any physical injuries. I am devastated that this has happened and am curious to see if anyone has ever heard of anything like this before? We obviously took the stray cat to the pound and he was put down. No one at the animal shelter had heard of this before either. I only wished I had caught the cat earlier and taken it to the shelter. I'm so sorry to hear of your loss. Please don't blame yourself for not taking the stray to the pound. You thought you were doing the right thing and how could you possibly know that the cat would come into your home and attack your own pets? I have never heard of such a thing happening, but I do know that cats can get pretty vicious while fighting. It is possible that the stray was trying to insert himself into your household and the only way to accomplish that was by killing the alpha cat in the household. I'm thankful your other cats are okay. There are a few things you may want to consider in future. First, I don't allow my cats outside any longer. I have found that it is not safe for them. Not only are there stray cats that will pick fights, but they can catch diseases from those fights. Also, there could be a loose dog and in our area, which is rural, there are coyotes. My recommendation would be to make your cats completely indoor cats and remove the cat doors altogether. If you are not yet able to do this, then there are some pet doors on the market that are electronic. The receiver is in the collar and the only animals allowed in or out are those with that collar. Think of it like an automatic door at a retail store, only you must have a pass to go in and out. I hope some of these suggestions are helpful. I'm sending some hugs your way. It's horrible to lose a pet in this way, and I hope you're able to heal soon and remember the good times with your cat. My cat is driving me crazy! She is five years old and I have had her a little over a year. In that time, I moved apartments. At my old apartment, there were blinds on the windows, but they didn't seem to bother her. At the new apartment, she thinks they are the perfect chew toy! In my room she completely destroyed them by chewing on the strings that connect the blinds together. The thing is, she never seems to chew on them when I'm not there. Typically, she starts chewing around 5:30 a.m. and wakes me up. I've tried spraying her with water and saying no. I even bought a bitter tasting spray to put on the blinds, but all of this didn't deter her. I decided to get drapes instead and pull the blinds all the way up. At first, she left them alone (for about a week) but now has decided she'll scratch them to get my attention around 5:30 a.m. I'm at a loss. Spraying water doesn't work, and if I lock her out of my bedroom she just cries. She has food in her bowl and fresh water and a scratching post, so what does she want? How do I get her to stop this behavior and save my brand new drapes? One of my cats licks the window blinds too. I am not sure why. I think it may have something to do with the coating or maybe she's just weird. There probably is not a lot you can do to stop this behavior short of taking the blinds down or replacing them. Do you know what type of blinds were up at your old apartment? Since she did not seem drawn to those, it might be worthwhile to invest in the same blinds for the new place. Also, please make sure that you fix the cords by cutting them short and making sure they are two separate strands and not one single strand. Fix them just as you would for a human child as kitties can strangle on blind cords as well. Also, instead of the bitter apple spray try a specific cat repellent. They sell it at any pet supply store. You must re-apply it every few days until she loses interest. Also, cats do not like the smell of moth balls, so you could try placing a few of those on the windowsill to keep her away. I hope some of these suggestions help. If all else fails, take down the blinds and use a roll shade instead or draw the drapes. We have just adopted three kittens from a rescue home. They are about five months old. We have a problem with them chewing through wires. They have already chewed through two phone chargers and a light cable. We want to give them the run of the house, but we're really concerned that they are going to get hurt if they continue to chew wires. Is this common for kittens, and is there anything we can do to stop this bad habit? Until the cats get a little older, I would go ahead and try to cover the wires in some way to protect the kittens since chewing wires is a potentially deadly activity. You could try purchasing some of the cord covers available at computer supply stores. There are also some safe sprays on the market meant to deter pets from chewing. These usually have bitter apple as a main ingredient to discourage the cat from returning to the area. If you don't mind spending a little more, you can try something like the Ssscat Automated Cat Repellant system. These systems are available at online retailers, such as Amazon as well as brick and mortar stores such as PetSmart. Place double-sided sticky tape on the floor or counter where the cat would have to step in order to get to the wires. Cats tend to dislike the feel of tape on the bottom of their feet. Keep the kittens entertained. The chewing might be a sign of boredom. Make sure you have lots of toys on hand for your new family members. Keep the kittens contained when you are not at home. Find a safe zone for them in a small room or even a cage of some sort. While cats do seem to be happier when they are left to roam, if your kittens are being destructive or putting themselves in danger, it might be best to contain them to a smaller area when you are away. I hope some of these ideas help. Thanks for the question and let us know how it goes. Hi there. I bought a little kitten three days ago. He is seven weeks old. I would just like to know when it would be safe to let him out on his own. We are currently keeping him indoors since we got him. He should obviously get used to his environment, but when I want to know when it will be safe to leave him on his own outside the house. I don't want him to "run away". Thank you. You may not like my answer, but it comes from years of experience and having let my own cats outside at different times. Yes, cats love to be outside. They love to hunt, especially if you are in a rural area. However, it really is not safe for a cat to be outdoors and I recommend that you keep your cats indoors at all times. I do this with my two cats now. Outdoors, your cat will be in danger from predators such as roaming dogs, coyotes (these are prevalent even in some cities) and other cats that might attack him and spread fatal diseases such as [Cat Flu|cat flu]. As I said, I learned this lesson the hard way from experience and from losing a cat to [Feline_Leukemia|feline leukemia], which was a horrid, painful and violent death for my cat. So, my answer to your question would be never. However, one solution would be to take him outdoors when you will be there to monitor him, either on a leash and harness or in a cat run. If you train him on the leash as a kitten, he shouldn't be too resistant to it. I hope this helps and good luck to you and your girlfriend with your new family member. He sounds adorable.